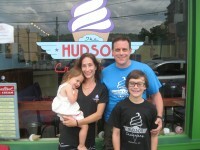 Yorktown residents John and Tracey Falcone recently opened The Hudson Creamery in Peekskill. Also shown are their children, Sofia and John John. Yorktown residents John and Tracey Falcone recently filled a need in Peekskill by opening the city’s only ice cream shop. But the couple is also helping fill the needs of others through their charitable work to help parents and children. The Falcones opened The Hudson Creamery on Hudson Avenue in mid July. A grand opening ceremony was scheduled for Aug. 22. Mr. Falcone, a Peekskill Police Department sergeant, said last week he and his wife considered opening a chain ice cream shop, but decided to open an independent shop instead on the advice of the landlord of the building, Louis Lanza. Aside from the typical ice cream toppings, the shop also offers olive oils, balsamic vinegars and sea salt. Some of the exotic sundaes that will be offered include The Godfather, featuring blood orange-infused balsamic vinegar, olive oil and sea salt, and The Peekskill Meteorite (based on the object that hit the city in the 1980’s) with a choice of any ice cream topped with Pop Rocks. The Hudson Creamery was chosen as the name of the shop because the establishment is located on Hudson Street, is near the Hudson River and the Hudson auto was a popular 1950’s car, Mrs. Falcone said. The restaurant has elements of 1950’s interior décor. The couple is dedicated to the community. A portion of the store’s proceeds will go to the Wonder Twins Fund at the Maria Fareri Children’s Hospital in Valhalla. The family became especially active in the Fund’s charitable work following the death of their twins, in 2008 who were born four-and-one-half months prematurely. The Fund provides assistance for families with children in the neonatal intensive care unit at the children’s hospital. “We were there for eight months,” Mr. Falcone recalled. One of the items provided to parents are journal books for them to record their experiences and keep track of care for their babies. Mrs. Falcone said when her twins were in the unit she kept her own journal. Since infants in the neonatal care unit cannot wear clothing, the couple conducts a blanket drive every year on the birthday of their late twins. The family has also donated 33,000 books for youths up to teen age in the twin’s memory. Mr. Falcone also has held a DARE night in which part of the store’s revenues went to the program. “I really want to get involved in the arts programs in Peekskill,” Mr. Falcone said. The couple wants to provide more than ice cream for the community, Mr. Falcone said.